On this day in 1933, the New York Times ran the above on their front page telling the story about a little man who was born in Austria, who became Chancellor of Germany. 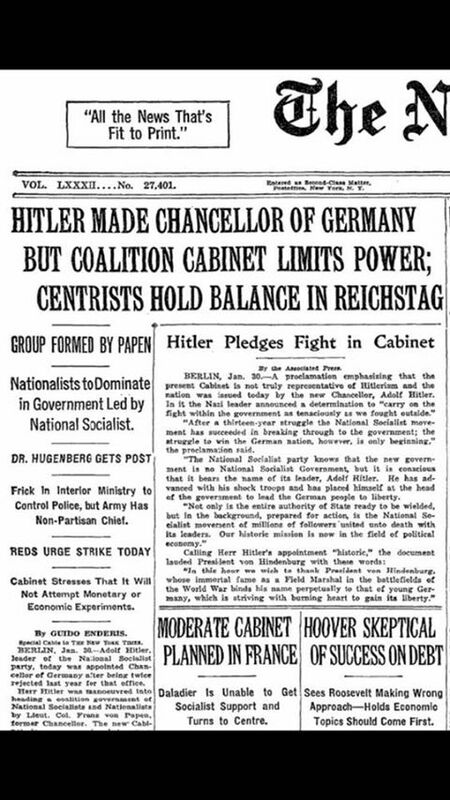 Little did anyone know at that point that the centrists who held the balance of power would shortly become the minority and that fascism would take control of Germany. Now, I’m sure many of you know the history of WWII and the way that the government of Germany became in control of the people in such a way that it seemed to be a kind of brain washing that was done. So much so that the country after WWII needed to have a complete reeducation which was dubbed denazification. It seems incredible that at that time, the “Way of the Nazi” was so ingrained into the fabric of the country in such a short period of time that people needed to unlearn what they had been told. Every day I am seeing more and more things which smack of “Hitlerism” (if that’s a word). And what worries me is that my friends in the USA are starting to feel as persecuted as members of my family must have felt at the time that Hitler came to power. (They were born in Dresden and were Jewish but luckily they were able to escape the country and were taken in by Britain before borders were closed and they could be caught). My friends in America have been abused both online and in person by petty minded little bigots who say that because they are gay/Muslim/Jewish, they are not wanted in the country they were born in or have entered and become residents in. Now, there has been a lot of criticism of people who have likened Trump to Hitler and I can understand that as Hitler was a monster. He was a murderer who was responsible for the deaths of millions of innocent people. But, I have to say that people need to look at history to understand how things can happen very quickly. Hitler started off with a minority of people supporting him. He vilified the Jews, making them hated within the country. He told the non-Jewish people that they are amazing, they are exceptional and tried to play on feelings of disenfranchisement. Trump has done the same, elevating people above others using Muslims in this way. He has played on stereotypes of Mexicans and this has led to the “build a wall” mentality. Hitler played on people not uniting en mass against him. If you ask someone “what do you think of Trump”, you’ll hear them mutter that he is a horrible man, he has terrible ideals, that he must be stopped. But ask them what they have done…..have they done anything to stand against him and most people won’t say a word. Hitler relied on this…Occupy the most senior positions in the land with your friends and people will tend not to take action against you. (I know there have been demonstrations in America and I’m not detracting from what they have done). When Hitler came to power, he made sure he was surrounded by people who would follow him no matter what. There was no one in his cabinet who would question his orders, no one at all. 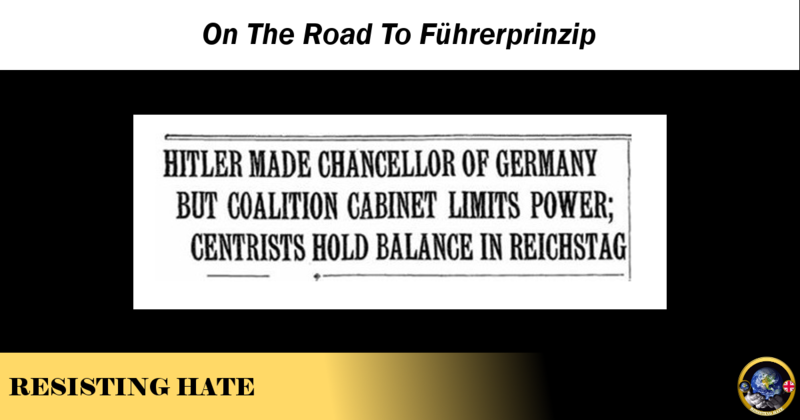 From the moment he took charge he silenced the press and created new laws which gave rise to “Führerprinzip”….which means that the Führer’s word is above all written law. Trump has no one in his cabinet who wants to question him. Furthermore, he has just sacked Sally Yates because she told justice department lawyers to not defend his Executive Order banning entry to the nationals of the 7 Muslim majority countries as she felt it is unconstitutional. Kellyanne Conway, the leading spokesperson for Trump, a couple of days ago launched a tirade against the media for the way that they have reported articles about Trump. Specifically she said “not one silly political analyst and pundit who talked snack all day long about Donald Trump has been let go”. This interview came shortly after Stephen Bannon (of Brietbart) said that the media was the “opposition party” which should “keep its mouth shut”. When Hitler took power, he controlled less than 4% of the 4,700 papers in Germany. He then outlawed the opposition parties and he censored the media so they only showed what he wanted them to show…….to me, Bannon saying the media should keep their mouths shut is the start of a desire to censor even if it’s not an outright ban (at the moment). There are many other similarities but I have a feeling I could send people to sleep if I write too much more. Fact is, there is more to what Trump is doing than meets the eye. The only way to stop him from doing what he wants to do and becoming more Hitleresque are…. 1. Support each other. Keep the fight fresh. Know you aren’t alone. 2. Keep up pressure. Regardless of what happens with petitions, the open letter to Trump and such things, the fact is that HE knows what he is doing isn’t liked. Even if the state visit goes ahead, when he arrives in the country he will know that over 1 million people don’t want him here and that 3 million plus people including many in the U.K. have signed to say he is a malignant boil on the bottom of the civilised world. 3. Keep yourself educated. Don’t fall for fake news. There are some funny sites out there which are very entertaining and are blatantly fake. There are some however that intertwine real news with outlandish “fake news”. But people are falling for the fake part because they know the real part is true. 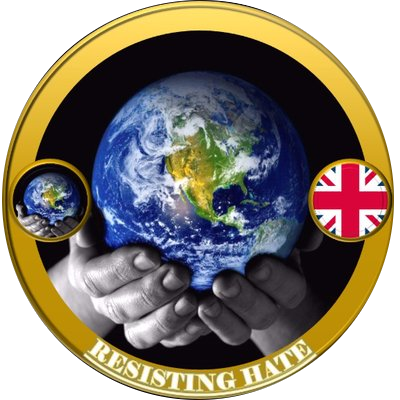 I will (as will my friends who run this page and our accounts on Twitter) continue to work on combating hate in person as well as on social media. 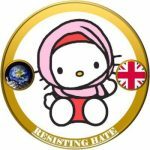 We will also not stop fighting not only religious hatred but also people who hate others based on gender, sexuality and much much more.